Everyone says Spokane needs a mid-sized venue. Here are six. Opened: 2010; used to be called Elements Night Club. 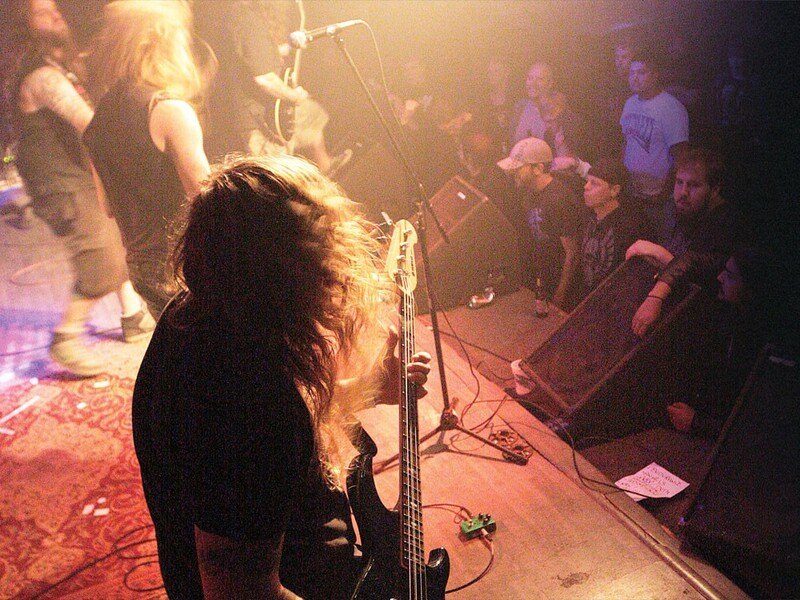 Go There For: Mid-sized metal and rock shows. Large open pit. Two bars. On our trip there: The neon lights, wall of mirrors and young female bartenders reveal its danceclub heritage. The space is wide open and not too pretty, but great for loud, rowdy concerts. It’s worth exploring the terrain: Work your way though the fog machine at the front to the bar. Fight through hair, sweat and blood in the pit. Try to get into the VIP lounge. Go There For: Excellent sound system. The outdoor stage known as “Mini Gorge.” Free parking. On Our Trip There: It doesn’t matter who you go to see, you should go and stay because of Larry Sumner, owner Lang’s father. He’ll tell you stories about the 52 guitars that hang on the walls there and can rattle off the name of practically every band that’s played at the Grail. Go There For: Shows so open-air they feel like they’re outside. Thursday night live music. Shooting hoops. On Our Trip There: More of a drink/bar/ dancing hotspot than a live music venue, and we were surprised to see a basketball court in the middle of the bar. Yes, you read that right. A group of girls was playing 2-on-2 when we were there while Lady Gaga bumped over the sound system. The venue is huge — and classy. A folk band or a blues outfit would really fill the place with the right vibe. The Owner Says: “We wanted to open up a cool, comfortable place where we could offer live music,” co-owner Kitty Kane says. “We’re obviously appealing to different groups — more blues, jazz type thing.“ Kane says since live music is new to them, she’s open to any style being showcased there. Opened: Used to be called Top of China Buffet. Reopened as Ichiban in 2007. Go There For: Tasty sushi, unusual acts and the cheap wooden stage. On Our Trip There: Come early for the food — the wait-staff is friendly and the drinks keep coming. The concert area might underwhelm you, but the older crowd and dinner-and-a-show vibe is inviting. It’s not the place to catch big-time bands, but it’s comfortable enough to come here often. Go There For: Original 1926 ballroom floor for dancing or moshing. Supper-club-style terraced seating for sipping cocktails and gawking at dancers/ moshers. It’s our own little Crystal Ballroom. On Our Trip There: We’ve been to AClub twice: once for Rough Congress and once for Japandroids. And the space worked for both. At one, AClub was a high-class spot: 40-something ladies twirling with their girlfriends on the dance floor. And for the other, kids sparsely nodded their heads in sync with the rock beat while the bar stayed packed and noisy. We stood there hoping, praying to the gods of Spokane rock that this place gets a regular booker and takes off. Go There For: Rhythm and blues. Sunday night jam sessions. An intimate dance floor. On Our Trip There: You never know who’s going to show up Sunday evening. Snoop Dogg or your next-door neighbor with a Fender. At first glance, the regulars stare. But after an oversized beer and a twirl around the ’80s dance floor, you’ll fit right in.